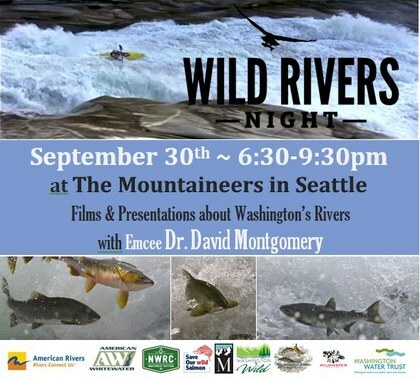 The Mountaineers is proud to host Seattle Wild Rivers Night, a free evening to socialize with your river friends while enjoying great food and drinks, films, photography, and presentations celebrating the wild rivers of Washington State. join us for Seattle's Wild Rivers Night! Admission is FREE and registering will guarantee entry at Wild Rivers Night. We are hosting Wild Rivers Night in support of the integral role our watersheds play in all of the wild places we love to play and in recognition of our human-powered community that gets out on these waterways. Join us to learn from Emcee Dr. David Montgomery, UW Professor of Earth and Space Sciences and head of the Geomorphological Research Group. Dr. Montgomery is a renowned river systems expert, author of King of Fish: The Thousand-Year Run of Salmon and Dirt: The Erosion of Civilizations, and winner of the Washington State Book Award and the MacArthur Fellowship. No river celebration is complete without great food and drink. Beverages will be available from Snoqualmie Brewery, Sawtooth Winery and Sky River Meade. A $10 pint cup purchased from your favorite river organization will get you 3 drink tickets. Extra drink tickets are $5 each (cash only for extra drink tickets). Dante’s Inferno Dogs will have hot dogs and sausages – meat and vegetarian – available for purchase. A silent auction of outdoor equipment, books, and art will take place as well. Proceeds from the event will go toward the conservation of Washington state rivers and fisheries. The Mountaineers are hosting Seattle Wild Rivers Night in partnership with American Rivers, American Whitewater, Northwest Rafting Company, Save Our Wild Salmon, Washington Water Trust, Washington Wild, Wild Washington Rivers, and Wildwater River Guides.